The classic red tiles of Shuri Castle indelibly mark Okinawa’s international image. The castle first was believed constructed in the late 13th or early 14th century under the hand of Satto, King of Chuzan and Urasoe Castle. Documented history picks up in 1429, when Sho-hashi brought Okinawa together under his rule and established his capital, with Shuri as his headquarters. The castle was the center of Okinawa power, religion and culture for some 450 years as the Sho Dynasty ultimately gave way to the Ryukyu Kingdom. Finally, the Japanese government forced King Sho Tai, the last Sho king, to surrender in 1879. The Meiji Government of Japan ended Okinawa’s independent rule and made it a Japanese prefecture. The early 20th century saw efforts to destroy the castle, but strong figures within Japanese government argued for keeping it. 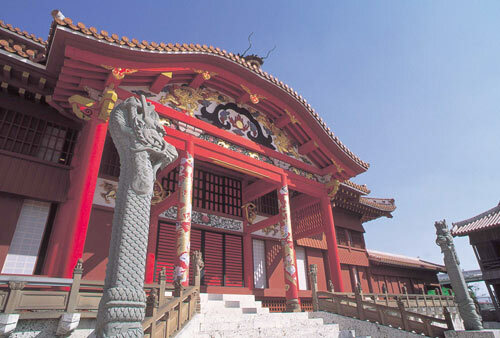 They won, and in 1925 Shuri Castle was designated a national treasure, and restoration work accomplished. World War II saw Shuri Castle pummeled and reduced to mortar and ash as American forces sought to dislodge Japanese 32nd Army soldiers who’d built a 1,000 meters long tunnel beneath the castle. The tunnel still exists today, although there have been no plans to restore it. Fire destroyed the original buildings. Replicas of the original castle grounds and buildings were painstakingly built, and the castle’s main gates and wall were restored as well. Following the Battle for Okinawa, the site became Ryukyu University until the mid-80’s, but the castle was restored to its glory in 1992, 20 years after Okinawa reverted to Japanese government control. There’s no enjoyable way to absorb the culture and history of Okinawa without leisurely making your way through the castle grounds and its principal buildings. Allow yourself a minimum of 2-3 hours. Cameras are recommended, but for those of forget, or want to be hands free, there is a souvenir store at the end of the castle tour where memorabilia can be purchased. Four gates and three buildings are the focus of a Shuri Castle visit. Kankaimon Gate is the main entrance to the castle, where historically, only the king, his court, and special guests passed. Two other gates, Kyukeimon and Kobikimon, were used by the castle court staff and for allowing construction materials into the castle grounds. The colorful Houshinmon Gate openes to the inner courtyard, in front of Seiden, the castle’s main hall. Nanden Hall is provides a snapshot into Ryukyu history, featuring laquerware and paintings produced across the kingdom’s hundreds of years. Hokuden Hall served a variety of purposes through the years. It is decorated in traditional Japanese style, reflecting its use as a reception area for Chinese dignitaries. It also served as an assembly building and as home to the Kingdom’s legal community. The heart of the castle, though, is Seiden, one of the most spectacular buildings ever constructed on Okinawa. Enjoy the dragons and count the pillars; 101 on the first floor, and another 92 on the second level, and still another 60 on the third floor. Seiden is the central state hall, used by the King. It is unique because of the combined Japanese, Okinawan and Chinese styles skillfully integrated into its wood construction. The reconstruction centers on court records as the building stood in 1712, using Taiwan Cypress imported from Taiwan. Admission charges are minimal: Adults Y800, Y600 for high school and college students, Y300 for elementary and junior high school students, and free for children under age six. Discounts are offered for groups of 30 or more. From the military bases, go south on Highway 58. Turn left at the Tomari Takahashi intersection (approaching downtown) and continue for approximately 10 minutes. The route is clearly marked with Shuri Castle Park signs. Follow additional signs to the underground car park.